More than 35 years ago, researchers at the US Department of Energy (DOE) worked on a promising technology to advance high-efficiency coal power generation using a device called a magnetohydrodynamic (MHD) power generator. Their goal was to successfully develop a topping cycle based on the physics of MHD, whereby the forces and properties of electrically conductive fluids, such as plasmas, interact with an applied magnetic field to produce electrical power. 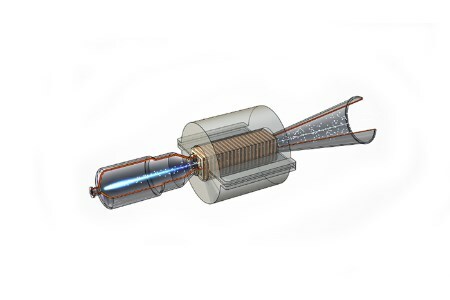 An MHD generator can basically act as an electromagnetic turbine, only instead of mechanical blades, the moving part is the electrically conductive gasses. This approach is attractive because it enables higher temperature power extraction, which yields greater combined cycle power generation efficiencies. The original DOE MHD programme was ultimately discontinued in 1993 due to unresolved technical issues and the expected high-cost of building a first-of-a-kind demonstration power plant. After a 20-year hiatus in MHD power research and development, today’s DOE researchers at NETL have picked up the torch again, armed with modern technology to boost the work. The effort is now referred to as direct power extraction (DPE), based on the overall technological concept. NETL researchers are developing an MHD generator featuring a plasma stream that is created by mixing and combusting a powdered additive with a fuel source (currently kerosene, but industrial-scale systems would likely use coal or natural gas). In the generator, a powerful magnet induces electrical current in the plasma stream, and electrodes harness the resulting power. NETL researchers are also pursuing a photoionisation technique for targeted plasma conductivity enhancements, as well as a ‘seed-less’ DPE system that will continually produce plasma inside an MHD generator using high-frequency, high-voltage pulses. MHD generators can be operated at very high temperatures, which means they can be highly efficient. The high-temperature capability of MHD generators is particularly synergistic with the oxy-fuel approach to carbon capture, which uses pure oxygen, rather than air, to burn fuel. As a result, oxy-fuel exhaust consists almost exclusively of water and CO2, enabling easy removal of water and leaving a near pure CO2 stream for capture. DOE researchers in the 1980s had to rely on expensive proof-of-concept tests to solve engineering and design problems, so relatively few options could be feasibly explored. Today, NETL researchers use simulation-based engineering to analyse and optimise multiple generator configurations before committing to full-scale tests. These modern numeric simulations allow an unprecedented reduction in development time. Researchers in NETL’s MHD Laboratory can then safely conduct experiments that validate the simulation tools. The lab is also used to test materials in realistic service conditions and test for proof of concept. These activities are enabling future MHD engineering applications that can provide the nation with a more efficient way of burning fossil fuels that results in fewer emissions. With the advanced simulation capabilities and cutting-edge facilities available at NETL, DPE research is making considerable gains towards the development of a robust, flexible and resilient energy network.